the scent of green bananas: it's fungal friday! Posted by santos. This entry was posted on 20060303 at 11:59 PM You can skip to the end and leave a response. why oh why can't I get past being horrified by mushrooms? I absolutely LOVE mushrooms, especially hunting for them. 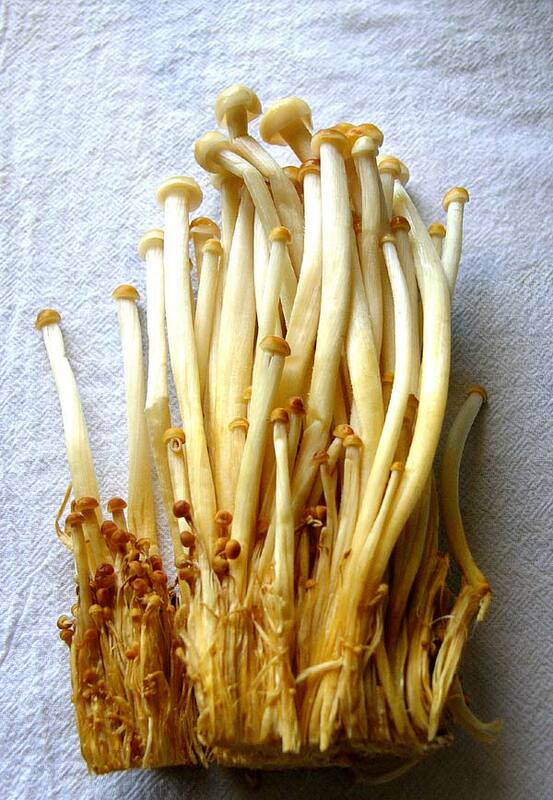 Here's a link to my chanterelle photo: Green Kitchen: Fungus and Fabric. I've been enjoying your blog. Mmmm I am mushroom obsessed. Greetings from another blogger! I'm a mushroom lover too & I cooked portobello mushrooms yesterday! A good substitute to meat during lent! YUM! mushies are da bomb. eeeaakk. c, oh no! is it the flavour, texture, or the way they look like dark forest dwellers? hi gk, thanks so much for the link! love your mushrooms, and your blog--so very crafty, you are. i'm green bananas with envy. saffron, the fungal bomb, bebe. now where's your mushroom?? mostly it's the texture, though I'm sure the appearance figures in for some of them. I know there was one time where it was purely the taste - I unwittingly had a piece pizza where mushroom soup (sauce?) had been used rather than tomato sauce. In that case I was thinking it tasted awful long before I figured out why. I can recall one time eating mushrooms in a nice restaurant where I (rather reluctantly) enjoyed them - I think they were trumpet mushrooms (does that sound right?) and they had been grilled or something, because they were very roasty tasting. I saw something on a cooking show one time - dried mushrooms were powdered and used somehow with meat (I think it was a roast that was coated with the stuff) - which I'm curious about, but generally I've made little to no progress in getting past my mushroom hang-up. I'm a huge mushroom fan. I'm currently obsessed with dried porcinis. Check out my blog for the Porcini and Parmesan risotto. I went to the Mushroom Retailer of the Year Awards lunch on Monday (my fablulous life) and apparently people are more like to buy mushrooms if they're pearly white which is a bit of a shame. Had mushroom ice-cream but couldn't get the chef to say which ones, not bad at all though. it's the fungal factor, i think. your fabulous, fungal life. i say wood ears were used in the ice cream, what say you? i had my first mushroom hunt last autumn. dear me when I came home hubby freaked out of my colourful harvest.. asked if I had them checked with the experts. what is the name of thy mushrooms here again? saw this at J's and MM makan post. this one is not available in europe. I'm not sure, I've only had wood ears as reconstitued slipperiness. I got the impression it was a dried mushroom given a pounding and my first guess was shiitake but warmed to porcini. Not these ones. Sha, they're enoki and reet tasty in a small bunch wrapped in bacon.